The Arrow third season premiere was titled "The Calm" but we might have caught a bit of 'the storm' by episode's end. Or middle. Actually, where was the calm? Things were kind of stormy right from the opening chase. To be fair, it was relatively calm before the date blowing (up) bomb but after that, it was bombshell after bombshell. Babies were born, 'birds' died and, as usual, a lot of references to the DCU were made. It's nice to have Arrow back. Even though it happened near the end of the episode, the The Flash premiere was last night so Barry Allen's appearance is technically from the past and I wanted to get the Flash cameo out of the way early since he already had his hour in the spotlight this week. As for the actual flashbacks, Hong Kong replaced Lian Yu as the setting for Oliver's ongoing 'training' with A.R.G.U.S. agent Amanda Waller (aka Mockingbird) using him for unknown errands. As long as it doesn't involve them saying mirakuru every two minutes. 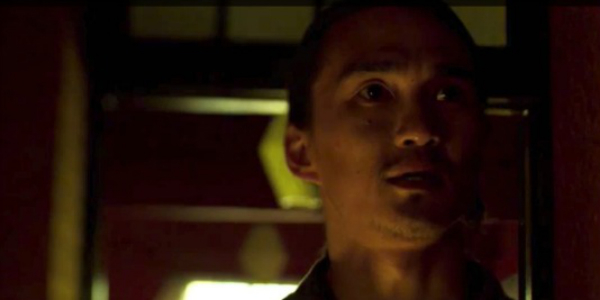 The family that Oliver eventually finds himself staying should be familiar to comic-book fans with Karl Yune playing Maseo Yamashiro and The Wolverine's Rila Fukushima playing his wife Tatsu. Don't follow that link if you want to keep her story a mystery. Before leaving the past for the present, it's worth noting that Ollie made reference to two of his previous girlfriends, both Sara (who made a, uh, surprise appearance in the premiere) and Helena. The latter would made a great candidate for The CW's third superhero series. But who cares about past girlfriends when Oliver and Felicity are presently going on a date? Of course, I already mentioned the bomb that ruined their night out and foreseeable future so let's just move on to Team Arrow's mission this week. Ollie's still living in Verdant, sorry, The Quiver ever since he lost all his money but he somehow can still afford some sweet trick arrows. Probably, just a stockpile. Meanwhile, Detective Quentin Lance is now a captain and seems to be suffering from the same heart condition as Hartigan from "Sin City." And Roy has really come into his own, looking quite sharp as Arrow's partner Arsenal. As for the villain of the week, once again Channel 52's Bethany Snow lets us know about the return of Count Vertigo, only this time the mantle has been taken up by Werner Zytle played by Peter Stormare. Zytle also modified the drug and now the pyschotropic brings out your biggest fear which allows for a pretty rad Oliver vs. Oliver fight scene. The final showdown with the Count takes place at Rockets Arena, where the latter is trying to take out his competition, including Mikhail Petrov (or maybe it's this Mikhail Petrov) and Luciano Costa. And the eagle eyed easter egg hunters would have seen that one of the boxers was nicknamed Wildcat and the Ferris Air advertisement hanging above the ring. To quote Michael Jackson, "the children are our future" so why not start this section by talking about Diggle and Lyla's new baby and how that means he might be staying out of the field. Of course, we know that Oliver is also very likely a father with a former college flame. I wonder if that will be explored this season? We don't see Thea in "The Calm" but the sister known as Speedy is mentioned, as are her father, Malcolm Merlyn, and League of Assassins. Our (first) Canary must have ruffled a few feathers in Nanda Parbat (again) since it looks like Ra’s al Ghul himself came to take her out. I don't think his daughter will like that. It does pave the way for Laurel to pick up the mask. 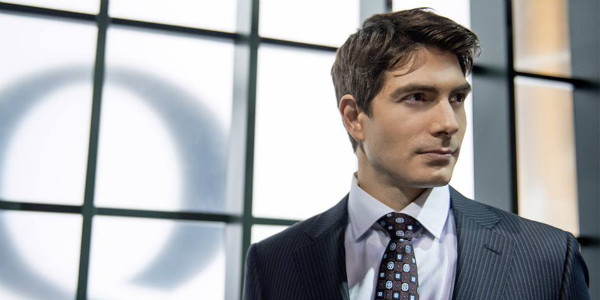 The premiere also saw the introduction of Brandon Routh's Ray Palmer (aka The Atom) who positions himself as a major new rival of Oliver's since he gains control of Queen Consolidated. I guess the Star City idea won over the board more than Ollie's heartfelt speech about his dead mom. Wait. That's the past. 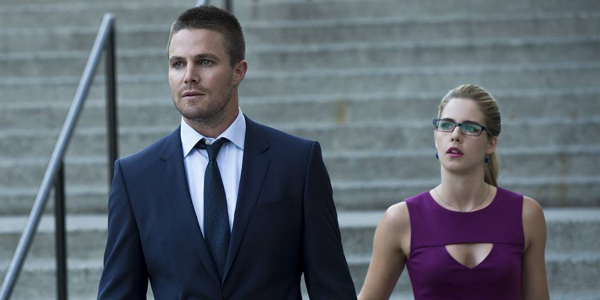 Arrow continues with Episode 2, “Sara,” next Wednesday at 8:00 p.m. ET on The CW. Created by Marc Guggenheim, Andrew Kreisberg and Greg Berlanti, the DC Comics inspired series stars Stephen Amell, Katie Cassidy, David Ramsey, Emily Bett Rickards, Willa Holland, Colton Haynes, Paul Blackthorne and John Barrowman.